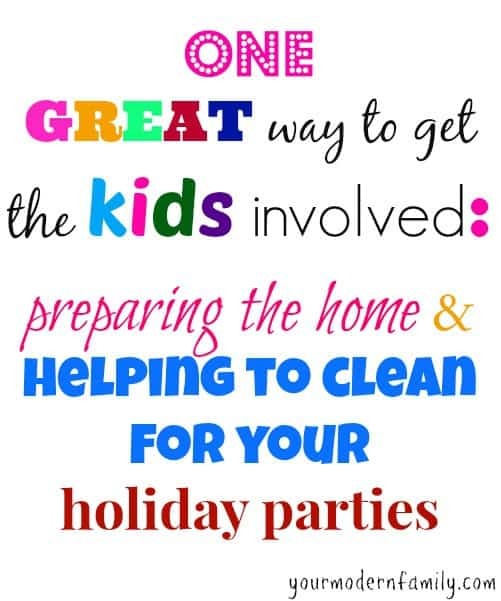 ONE AMAZING WAY TO MAKE CHORES FUN FOR KIDS – PERFECT FOR CLEANING FOR A HOLIDAY PARTY! Just recently, I wrote a post on how to put a spin on things when it comes to cleaning with our children and actually make it, wait for it moms…. FUN! That’s right it is possible to turn chore time into playtime or at least have the cleaning process go by with less battle and more harmony. With that being said, Becky and myself got to thinking about one of the tips I offered in the post. 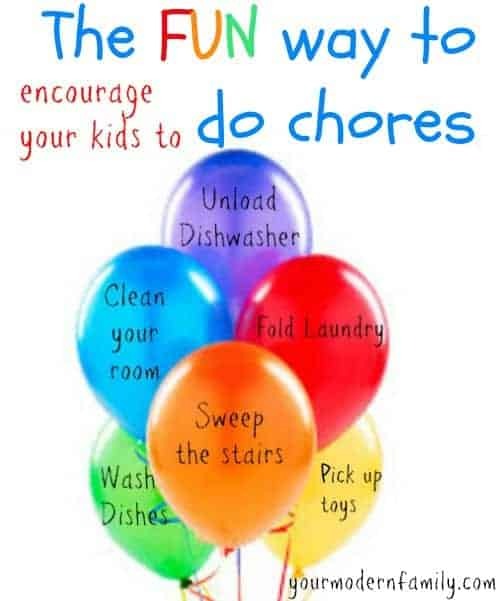 ***** Using the Balloon Chore Idea, you would take multi-colored balloons and write several different chores on each, spread the balloons throughout the house, call out a certain color and upon grabbing the balloon have the kids carry out the directed chore. Best part of all, the only way to make the chore “officially” complete is by popping the balloon! (Naturally) LOL. At my house it gets pretty nuts trying to get organized and get things ready around the house during the holidays. Oh the joy! If only text could show true emotion you would be able to hear my sarcasm from a mile away! OK, so enough blabber, let’s get to it! I have come up with a few great ways to use The Balloon Chore Idea as a way to get organized and take care of things around the house for the Holiday Season. Yep. This is about what it feels like. LOL! Whether you have guest coming into town to stay with you or if guest are coming over for a Christmas gathering, there is one thing we can agree on, everything in the house must be neat, orderly, and look as if we always have a maid on staff 24/7! (By the way, if anyone want’s to buy me a Christmas present, a hired maid/nanny for all my cleaning needs would be just fine by me.) Unfortunately not everyone can afford such help, but have no fear mamas because we all know that is what kids are for!! Right??? So, if we must put our tiny tikes to work, the least we can do is make it fun for them. First figure out what needs to be organized and put together in the house. For example. Closet space for guest, the tupperware being matched and put back together for clean up after holiday dinners, bathrooms etc. Assign each chore to a child or if you only have one child, have them invite a friend or two over and make it a team affair! After deciding who will do what, write out specific instructions on how you would like each chore to be carried out. Number each and fold each step into different sections small enough to fit inside the balloon. Blow up each balloon; take a marker, and write each chore and the child’s name who will be carrying out that chore. From there, take some tape and stick the balloon to each area assigned. Have everyone gather in one room and countdown to letting them take off to discover what there “duty” is. Walk around and help out as you see fit but for the most part let them, once finding their name, pop the balloon and put in order the step by step instructions! The first to complete the duty properly wins a prize. It could be ice cream, candy, a cool toy whatever you like! Either way they will love it and the tidying will be done!! Now this is my personal favorite part of the holidays! THE FOOD. Oh the holiday’s, so much joy and so many calories. OK, so that is not my favorite part of the holiday season by any means, but, hey, it comes with the territory. While I do enjoy cooking on my own time, something about the holiday season just screams, headache to me. You have to prepare much more than usual, get creative and fancy. Whewww, it can be exhausting. Thankfully we can have tiny little helpers to pitch in and get things prepared for holiday meals and they will feel great knowing they had a hand in creating a special dish. Figure out exactly what the kids are going to help prepare, whether it is going to be a dessert, or something for Christmas dinner. For my son, his best little friend, and for myself we are making Cookie Grams. Recipe found in Parents magazine. Now to make it fun for the kiddos, turn helping out into a scavenger hunt! The best part of this recipe is there is no actual “baking” involved. For me, and call me a lazy mom, but I am happy to skip that step. LOL. For this cookie recipe you simply take Nabisco Vanilla Wafers . Some green and red frosting, have the kids help frost however many cookies you would like. For me that usually means about 45 to 50 cookies. They are pretty small and for a Christmas gathering you want to make sure you have enough. After frosting, place the cookies in the fridge overnight so the frosting can harden. The next day, you and your little helpers will write out a holiday inspired message along the individual cookies. NOW this is where the fun starts. Scatter balloons in hidden places around the house with a Christmas message on each balloon. It could be anything. For example: “Merry Christmas, Happy Holidays, Joy To The World.” The next morning have the kids race around the house trying to find the hidden balloons. Once they find them, let them read out the selected message on the balloons. From there take white tube frosting and have you and the kiddos write the message on the cookies and Voila’! The Christmas cookies are done, and ready for family and friends to enjoy! So not only is there tidying, organizing, cooking and baking to get done before Christmas, but also there is decorating to be done! If you are like me I don’t get too carried away just a few things here and there. Whether you need stockings hung, the Christmas tree decorated or wreathes put up, it is always nice to have a little help. 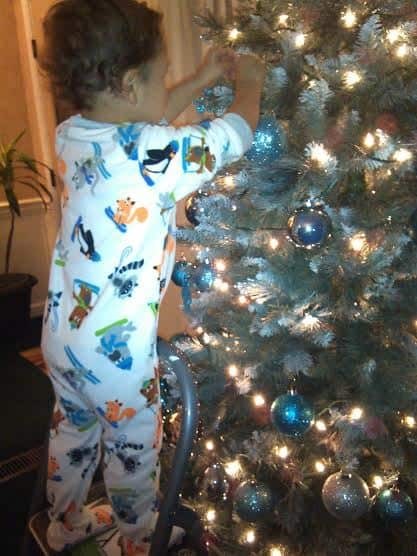 Here’s my little man helping me to decorate the tree! First figure what needs to be decorated and what it will take. Place all that you will need for each task in some type of bin, or tub. For example, if one bin was designated for the tree, you would find, ornaments, lights, tree skirt, and tree topper. From there use the balloons to create an obstacle course of sorts throughout the house. You can get real creative here moms. Take the blown-up balloons and tape them to several different areas of the house but use them to create an obstacle course or a map to follow to lead them to their bins. Line them up like a road, and have them follow the balloons, have that trial lead to one bedroom and have a riddle on the several balloons, try not to make the riddles too complex . For smaller ones, I would recommend maybe having a letter and number for them to read out to you correctly. Once they solve it, they get to, pop the balloon and go to their bin. From there let the decorating begin! Here is a great link for small creative, and fun riddles for the kiddos! So here we are, all is decorated, baked, prepared, cleared out and ready for guest or Christmas celebrations! I hope you enjoyed theses ideas and can even use them this holiday season! What do you do at home to get the little ones involved in the process? I am always interested in new ideas!! Weigh in and let us know here at Modern Family! 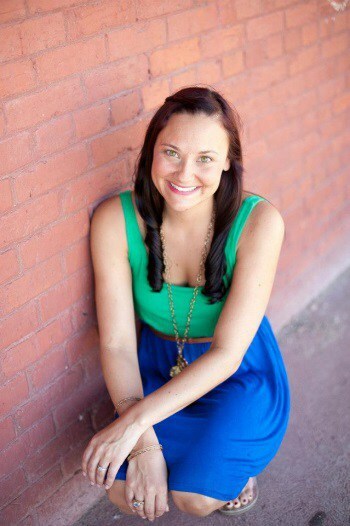 A little bit from Leah: Hello fellow bloggers, or maybe just readers, either way, a big HELLO THERE to ya! Let me take a moment to introduce myself. My name is Leah Elizabeth Locklear. I am a mother to a three year old “wild man,” a writer, loving and honest friend (maybe too honest LOL), and I am the staff writer and blogger for the clothing line Cutie Pie Clothes. We offer baby and women’s accessories and apparel. Our blog, Wonder MOMents, is linked to our site. We really wanted to further connect with our customers and even gain new ones so Cutie Pie’s created our blog and hired yours truly! Wonder MOMents is a place for us moms – where we can share ideas, let off some steam, have a few laughs and more! For updates and fun follow us on Twitter, Facebook, and Pinterest!